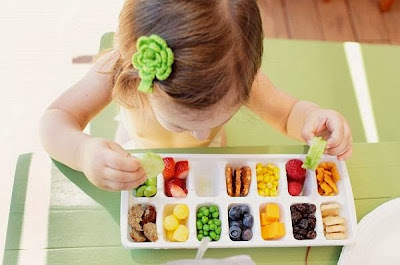 With their smaller stomachs, kids may not eat much in one sitting, but they do eat often. The problem is, children are not only notoriously picky eaters, they'll usually fight for sugary junk food. It's a constant struggle to find snacks that are both appetizing and good for them. Because many kids get about one-third of their daily calories from after-school snacks, these nibbles are as important as a balanced breakfast, lunch or dinner [source: Iowa State University]. Luckily, we've got 10 healthy snack ideas that kids will love. OK, so we're not suggesting you buy your kids a huge tub of popcorn at the movies. But when it's not drenched in butter and salt, popcorn is actually a very healthy snack for kids -- it's packed with whole grains and fiber. Studies have shown that these grains may lower your chances of developing diabetes and heart disease [source: Health]. The problem is, kids usually aren't as excited to eat plain popcorn. So to make the healthy version more appetizing, some people like to sprinkle cinnamon on top. Another popular alternative is garlic, in crushed or powder form. Although it won't do any favors for your breath, garlic supposedly helps lower cholesterol. However, this claim (along with various other reported health benefits of garlic) is still up for debate [source: Renoux]. HINT: If all else fails, you can also just add plain popcorn to your trail mix. A good source of calcium, cheese is also versatile and goes with plenty of things kids love. String cheese is a popular favorite, as are grilled cheese sandwiches. Cheese and crackers is also a filling snack. But avoid the store-bought cheese and cracker packages. It should be no surprise that these aren't made with real cheese, but with what's called cheese food. The crackers are baked with refined white flours, which aren't too healthy either. Instead, nutrition experts recommend making cheese and cracker snacks at home with real cheese and whole-wheat crackers [source: Bohn]. HINT: For the healthy version of grilled cheese sandwiches, coat your pan or sandwich press with nonstick cooking spray instead of butter and use whole-wheat bread in lieu of white. Sometimes, it just takes a simple trick to turn a boring meal into a fun one. However, we should mention that this snack involves lunch meats, which may contain nitrates. Nitrates are effective preservatives, but they have been linked to various cancers in animals. Some experts recommend avoiding them altogether and looking for nitrate-free meat in the store. But if you do partake in lunch meats, make sure you and your kids also get generous doses of vitamins C and E [source: Haas]. Now that you know about the dangers of nitrates, time for the snack idea. Instead of the same old sandwiches, try rolling up lunch meat into bite-sized wraps. For extra flavor, spread mustard or tuck cheese slices inside the roll-up. HINT: Salami with cream cheese is a popular combo. What kid doesn't love pizza? For a quick, healthy snack at home, toast up an English muffin (the whole-wheat variety is best), and add some tomato sauce and low-fat mozzarella cheese. You can make your own simple tomato sauce using tomato paste and seasonings, such as oregano and garlic. Whipping up mini-pizzas can be a fun activity for kids, too. Allow them to choose and arrange their own toppings on their individual muffins. Give them choices of veggies, such as bell peppers or mushrooms. You can also offer the classic pepperoni. However, be warned: Some people are concerned about the amount of unhealthy nitrates you'll find in pepperoni -- we'll learn more about this next. Rich in vitamins and fiber, applesauce can be a healthy snack and another way to get kids to eat their fruit. Again, low-sugar varieties are best. After the infant and toddler years, a glob of mushy applesauce may sound boring and bland to your young ones. To mix it up and make it more palatable for kids, add cinnamon and stir in raisins or nuts. As it turns out, cinnamon is not only a delicious spice, its health benefits are nothing to sneeze at. The U.S. Department of Agriculture has found in many studies that this spice humans have been using for thousands of years could help lower blood sugar in addition to helping lower cholesterol [source: Walters]. HINT: For another fun way to serve applesauce, you can freeze individual portions to make applesauce popsicles. Although high in fat, peanut butter is packed with fiber and protein. If your child has peanut allergies, you'll have to steer clear of this snack choice. Such allergies have become increasingly prevalent in recent years, so it's important to watch for evidence such as rashes around the mouth and face. But sometimes, more severe reactions occur, such as difficulty breathing, which require immediate medical attention [source: PBS]. If allergies aren't a concern, kids love peanut butter spread on graham crackers or paired with different flavors of jelly for a classic PBJ. Try smearing peanut butter on a celery stalk and topping it with raisins to create a treat with flair -- ants on a log. HINT: Opt for natural peanut butter to avoid trans fats and added sugar. Cereal is a great source of fiber, which is filling and healthy. Unfortunately, many cereals that kids love are full of sugar. Consumer Reports investigated the sugar content of some brands and found that a bowl of Kellogg's Honey Smacks serves up as much sugar as a glazed donut [source: Consumer Reports]. Several other popular kids' cereals also had hefty amounts of added sweeteners. The good news is that Consumer Reports rated several kid-oriented cereals as both low in sugar and nutritious. These include Cheerios (regular and Honey Nut varieties), Kix and Life. FACT: Fiber helps with digestion and can also help lower cholesterol.